Robot Commander has two versions: One for the Android phone, and one for a workstation. iPhone’s are not currently supported. 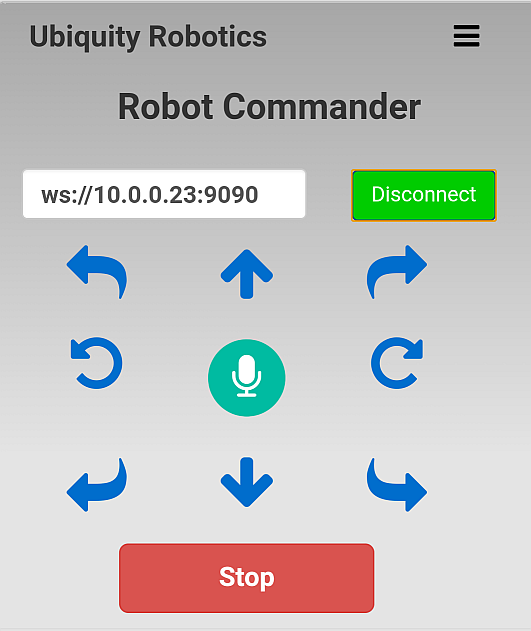 If you haven’t, install the Robot Commander app on your Android phone. Download it on your phone at https://play.google.com/store/apps/details?id=com.jrlandau.robotcmdr. Allow at least 1 minute after turning the robot on to allow the robot to boot up. The robot will come up as its own WiFi network. So on the phone, if you go to Settings/WiFi, you should see a WiFi network that looks something likeubiquityrobotWXYZ, where WXYZ corresponds to 4 hexadecimal digits. Connect to this network. The password is robotseverywhere. Enter the address ubiquityrobot.local in the space to the left of the Connect button. Continue with #6 below. Press any arrow to move the robot. To keep the robot moving, keep pressing or clicking. Say, “forward”, “back”, or other commands. There is a list of commands in the menu in the top right corner of the screen. The forward and back and the rotation commands allow you to say how far, for example “forward 3 feet” or “back 5 meters”, or “rotate right 90 degrees”. Where there is a lot of competing speech, you can turn on the “wake word” feature, in Settings. When it is on, all commands must be prefaced by the wake word, “robot”. * These commands require navigation to be operating. which was described in the section on connecting a workstation.